Since writing my posts about running, I have received a few e-mails and facebook messages from some Signature Mom readers about how to get started running. I figured that since some of you actually took the time to contact me about running, there might be even more of you out there interested in running. I am far from a running expert. I don’t know much about the technical side of running, I have a really funny gate and I’m sure I do a lot of things wrong when I run, but I love the way it makes me feel and I do it a lot. So, for all intents and purposes, in my eyes that makes me qualified to write this post. If you have never run before, do not expect to go out and run 3 miles the first time you run. Run a little, then walk a little, then run a little more. Every time you go out, try to run a little bit more than the last time. Please start out short and easy. If you keep at it, you will make progress. As you start getting into your running groove, setting little goals along the way can’t hurt. For example, try to run from one light pole to the next. The next time you run, try to run two light poles. Keep “upping” those goals, but don’t bite off more than you can chew. For me, when I feel successful at something I’m more likely to continue it. If I set goals too high initially, I will likely feel more failure than success. Set those goals small, but definitely set them. There are a lot of resources out there that can help you with an initial training program. I have heard great things about the Couch to 5k program. I haven’t personally done it, but I have heard of tons of people who used this program to go from not running at all to running a 5k (or 3.1 miles). 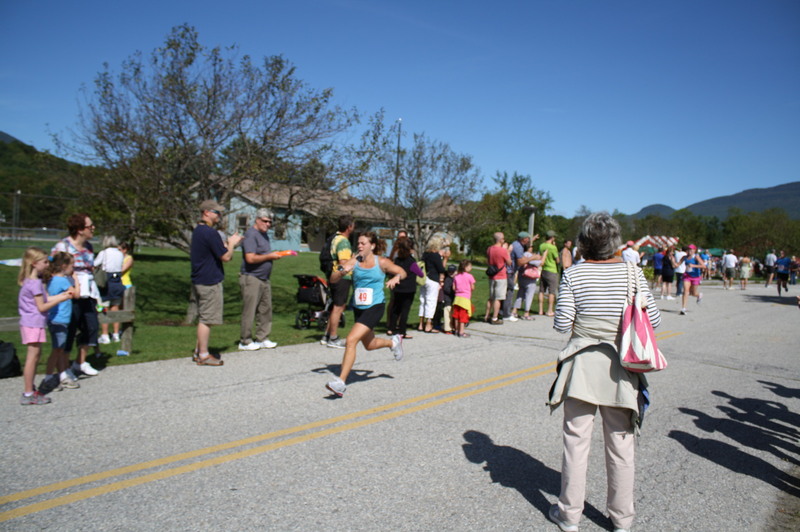 Even if you aren’t signed up for a 5k, using this sort of program will help you start running. People have asked when I find the time to run. Scheduling your runs is a very individual thing. It totally depends on your work schedule, your spouse’s work schedule, your kids’ schedules, whether or not you are a morning or evening runner and if you can run on a treadmill or prefer the road. Personally, I love to run early in the morning. I like getting up at a ridiculous hour, watch the sun come up and clear my head before the craziness of the day starts. But, I also enjoy running in the afternoon and evening. I fit it in when I can and it varies depending on the day itself. You are going to have to figure out what works best for you and your family. Running is amazing exercise and it burns a ton of calories, but it is important to alternate it with strength training. You need to work and strengthen your muscles to avoid injury. I didn’t realize how crucial this was until I got hurt during my marathon training. I have since added strength training to my routine two or three days a week. It is also important to stretch to lengthen those muscles. I admit I am horrible at stretching. It’s not from lack of trying, but most days when I walk back into my house after a run I’m immediately attacked by my kids and thrown back into mommy mode and the stretching is completely neglected. Because of this, I try to stretch during other parts of my day (before I go to bed and right after I get out of bed for example). 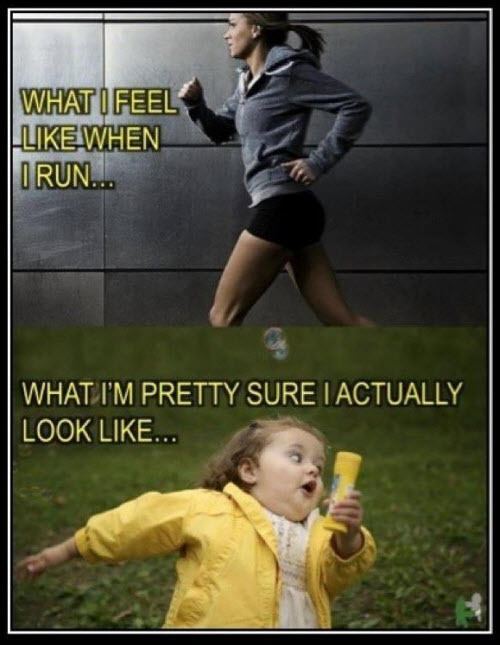 Running is a funny thing. There are days when I think I’m going to have a great run and I end up slogging through the entire run and there are other days when I feel like I have wheels instead of feet. Sometimes for me this happens within the same run. Try to not get discouraged if you have an off day. Honestly, as much as I claim to love running, there are days when I absolutely hate it and wonder why I torture myself with it. Then I finish the run, can breathe that much clearer and remember why I love it. I always love the way I feel after a great run. Try to make running fun. I love playing around with music. I have a really eclectic mix on my iPod. I am a bit of a dork and set up playlists for my races. This year, they all started with “Let’s Get it Started” by the Black Eyed Peas, naturally. I’d set them up so that about half way through the time I’d think it would take me to run the race I’d hear “Living on a Prayer” (you know, “Oh, we’re half way there!”…told you I’m a dork) and about 4 minutes out from my goal time Madonna and Justin’s “4 minutes” would play. Pick songs on that inspire you (I like songs that have the word “run” in them) songs that make you think of someone you love (“Perfect” by Pink is a constant on my race mix-a little shout out to my daughter) or songs that make you want to run fast. Music is very personal so pick songs that get you moving and make you smile. There is a whole tribe of mother runners out there you can turn to for advice and inspiration. A few of my favorites are Another Mother Runner, Shut Up and Run, From Fat to Finish Line, and Mile Posts. So many times I’ll read posts on these blogs and actually tear up (or cry like a baby). It’s amazing how an activity can touch you in such an emotional way. Until recently I felt embarrassed to even think of considering myself a runner. To me a runner was someone who could run a sub-7 minute mile, someone who had hardly any body fat, or someone who had tons of marathon medals and I fit in none of those categories. But I’m realizing now that does not encompass the definition of a runner. A runner can be anyone who enjoys lacing up their sneakers, finds exhilaration in letting wind blow on their face, loves the dull ache in their legs and lungs after a great run, and gets out there because it is important to them. I am happy and proud to consider myself a runner. I know soon you will be a runner too. Reading this brought back memories of when I was running regularly, a long time ago. Thanks for sharing.